I am a native New Yorker, though I’ve lived in the Boston area for 30 years. I love my adopted city, but I always look for a reason to get back down to New York City, particularly with family. A decade or so ago, I started doing annual father-son or father-daughter “48 hour whirlwind New York weekends.” I take one of my 5 kids each trip (they all get turns), customize the weekend for whichever one I’m taking, and pack it in with as much fun stuff as possible so that we’re running from morning ‘til… well, morning!… all weekend. As all of you can certainly understand, this becomes more challenging when I take one of my food-allergic kids, particularly my middle son who has tree nut, dairy, and sesame allergies (though we’ve done this trip when he still had egg and peanut allergies as well – now THAT was difficult, particularly breakfast). On our most recent trip, I decided that we had to have one dinner at Blue Smoke. Blue Smoke is a barbecue restaurant that continuously gets rave reviews from the food allergy community on AllergyEats – in fact, it’s the 2nd most highly rated restaurant in Manhattan! (4.7 out of 5, 31 ratings) Add to that the fact that it’s a barbecue restaurant. My son and I love barbecue! I remember well the words he told me son as he sat next to him on the bench. “Don’t worry. You’re going to be well taken care of and you’re going to have a great, safe meal.” It struck me as a pretty powerful statement at the time. After an amazing experience with awesome food, I shared with this manager what I do here at AllergyEats. (He was already familiar with AllergyEats.) I told him of their stellar reputation in our community. (Again, he knew.) And, given the great experience we just had, I asked if he would let me interview him for this AllergyEats Blog. So here we go. The following is my interview with Seth Frankle, Assistant General Manager of Blue Smoke, 116 East 27th Street between Park and Lexington Avenues, New York City (For trip planning purposes, this location is walking distance from the Empire State Building.) Take note that there is a second highly-rated Blue Smoke location at 255 Vesey Street between West Street and North End Avenue, near the World Trade Center cite. AllergyEats: Accommodating food-allergic guests properly is obviously a priority at Blue Smoke. When did the restaurant first make this a priority? Seth Frankle: I’ve been at Blue Smoke going on four years now and the entire time I’ve been here it’s been a priority. I think it’s more that in the restaurant it’s a priority to take care of people’s well-being, whether they have allergies or not. But when someone comes in with allergies, we’re ready to go. AE: Do you know if there was a specific situation or event that made the restaurant say, “Okay, we need to make food allergies a higher priority”? SF: There weren’t any specific situations. It’s something where the kind of people that we have working with us are those that come to work every day with the goal of getting better and improving day in and day out. Over time, you get ideas and you find ways you can improve your process. The allergy menu that you saw came from that kind of mentality. AE: What are your food allergy protocols and how do you safely serve food-allergic diners? 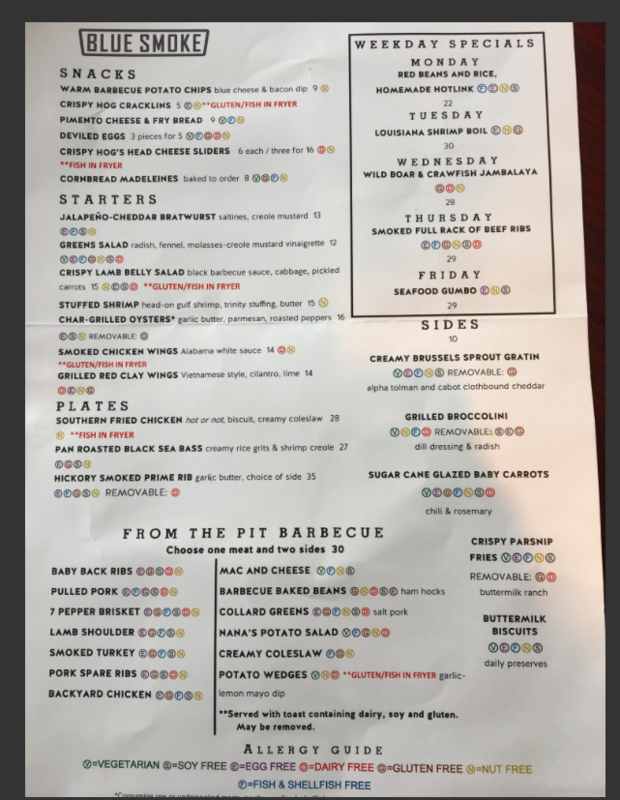 AE: Since you mentioned the menu, you have a great allergy menu showing which items are safe for those with various allergies and dietary preferences. Beyond the big eight, however, how well can you accommodate those with less common allergies like sesame, corn, garlic, chicken, red dye, etc.? AE: I assume it’s also a great courtesy to you because that way you don’t have to stop or slow down the kitchen as much if you know in advance who’s coming in? SF: Yes, it gives us a little more of an ability to be creative and to flex our creative muscles and give them something unique. But we’re not going to let anybody leave hungry and we’re not going to let anybody leave not feeling their best. AE: Do you have a scratch kitchen? Do you make things from scratch? SF: Almost all the ingredients that we have here are made from scratch down to the barbecue sauce and the biscuits. So that gives us the ability to really know what’s going into our food. In terms of making something from scratch, we’d love to. It’s dependent on what’s going on in the restaurant. If the kitchen has 40 tickets up, it’s going to be a little more difficult to make something from scratch on the fly in the middle of dinner service, but if we’re able to we’re happy to do it. AE: So that’s another reason people should call in advance. AE: Back to the protocols, how is the kitchen set up to prevent cross contact with the diner’s food allergies? SF: I think the most important thing to mention on that is that we train our staff and make sure we’re doing the same thing every single day. We’re very conscious with the cooking surfaces. For example, if somebody orders a burger and we know that something had hit the grill with their allergen, we’re not going to use the grill at all. We’re going to take a separate frying pan out, we’re going to pan fry it, broil it, whatever we might need to do to avoid cross-contamination. There are times that we get a request and we have to say, “I’m sorry, this is not something that we’re comfortable doing. I don’t want to risk getting you hurt.” That open-minded communication is important. We always find something each diner can eat, but we’re not always able to do everything – out of concern for the safety of our guests. AE: Right. Everybody in the community appreciates that upfront honesty. SF: Of course. I went to a restaurant last week and the waitress described this chocolate cake and it sounded amazing. I said, “You know, I’m sold, I’ll take it.” When she went back to the pastry chef, he mentioned “Hey, this pan got sprayed down with soy at the beginning of the day. I’m not comfortable serving it to him.” The bartender came back and said, “I’m really sorry. The pastry cook isn’t comfortable serving this to you,” and I said, “You know what? Thank you so much. You don’t need to worry about it or be sorry at all. I’d rather feel good tonight.” That’s good hospitality to let someone know when something’s in the best interest of their health. AE: You’ve personally got an interesting mix of common, slightly common, difficult, and less difficult food allergies [as noted above]. So if I could ask, when you go to work and want to eat a meal at Blue Smoke, what do you have? What do you like? How many options do you have? SF: Well, I’m one of the most fortunate people with food allergies because I have chefs around at all times and, in my experience, their attitude isn’t that this guest can’t have this or that; what they’re doing is saying, “Okay, what do I have that this guest can eat.” So I’m surrounded by people day in and day out who are willing to do that for me as well as our guests. If there’s anything for sure, it’s that I’m not going hungry here. There are so many options for me, including all the barbeque, and that goes back to us making a lot of our items from scratch because we know exactly what we’re putting into our meals. AE: While all allergies are equally important, there is a large contingency of peanut- and tree nut-allergic individuals who will want to know if you have peanuts or tree nuts on the premises. SF: Yes, we have some in our pastry station and we have protocols in place for using different gloves and keeping them on a separate shelf and things like that. But we’re always upfront about what we have on premises. AE: Jumping over to the training you had mentioned earlier, more specifically, what kind of training do you have in place for new employees and are there ways you provide continuous training to existing employees? SF: Absolutely. We have a website that we use called Restaurant Reason where we upload all of our training materials to a digital format. Every single person that we hire is then given a link to this website where we have background on the restaurant, we have the full menu, and we have descriptions for every item – one of the components of that is the common allergens in each of those meals. So before we have anybody even start with us, they’re being given that information. As we go through our daily routine, we do pre-shift meetings and we’ll regularly do a little focus on allergies and we’ll talk about how to best help those people we know are coming in with food allergies. But in the heat of service it’s more about having an open line of communication and when we have every single person working on the same page about what someone can and can’t eat, as well as an open door policy where we expect our servers to know (but we’re happy to teach them if they don’t), we’re set up for success. AE: Is it part of the protocol that when someone has a food allergy, a manager will step in at some point in the process to make sure things are being handled correctly? SF: Of course. Even if you don’t see a manager come to the table to discuss your allergies with you, they’re always working on it behind the scenes, checking the ticket and making sure that everything works. If something got ordered that doesn’t jive with someone’s food allergies, we’ll usually be the ones that come in and help find a new solution. But it’s a 100% team effort here. AE: What advice would you give to other independent restaurateurs wrestling with whether or not to make the investment to become more allergy-friendly? SF: I would respond in a similar fashion with what we talked about at the beginning – that whether it’s an allergy or not, making sure that people are safe when they eat at your restaurant needs to be a priority. It’s an important responsibility to take people’s health into your hands when you feed them, and allergies are just an extension of that. I would say that they should stay consistent in their processes. If you’re changing up the base of a sauce on a weekly basis, it’s going to be near impossible to know what’s going into your food every day. If you have a different cook working off of a different recipe, it’s challenging. The other thing I would say is to be open and honest about what’s in your food. You get some places that like to keep secrets about what’s on the menu or what’s going into certain items, but when you’re open and honest and let people know what they’re eating, it equips them to be able to have a safe meal. AE: How does it feel knowing that you have such a strong AllergyEats allergy-friendliness rating and that you’ve done a great job making many food-allergic diners feel comfortable and secure? SF: It feels really good seeing the excitement on a kid’s face when they’re able to eat. It’s really nice having parents say that they have finally been able to relax and enjoy themselves and go out to eat. But it’s equally valuable when an adult says it. Just because you’re 40 years old and have food allergies, it doesn’t make it any easier. We want to be there for everybody. So, it makes me feel great, but it’s something that we’re going to continue to work to get better at as well. AE: Thank you for your time, Seth. And thank you to everyone at Blue Smoke on behalf of my family, as well as the food allergy community. If you’ve dined at Blue Smoke, or any other restaurant that was just as accommodating (or not – we need those, too! ), please share your experience by rating the venue on AllergyEats today. (Basically, rate ALL your dining out experiences!) We can all learn from each other, finding new places to dine, and avoiding those that can’t – or won’t – accommodate us. We are all in this together! Great interview, Paul. What comprehensive training! I’m glad to hear that they continue to excel at managing food allergy preparation! We ate there a couple years ago and were wildly impressed with how well they managed my son’s dietary needs. It’s not often that you have a restaurant worker report back to you to inform you that they have just “cleaned the line” and are preparing my son’s meal. This communication definitely eases the mind! My son loved his barbecue as well. Can’t wait to try this place!! Let’s hope more places follow their lead. I’m sure I speak for the majority of the food allergy community when I say, we are so grateful for your accommodation and understanding! Thank you! My daughter’s favorite restaurant! She has PN and TN allergies. It is one of the restaurants where she feels comfortable dining. All Danny Meyer restaurants are amazing at accommodating food allergies. They take it very seriously and I always feel comfortable taking our family to any of their establishments. We went to Blue smoke for lunch this weekend!! We had such a positive experience. Seth the manager went through the menu and helped us choose the food that was safe for my kids! He said he had the same allergies and was very knowledgeable about the items on the menu! My kids were so happy and I was relieved to eat at a restaurant worry-free!!! MARCH 2019 UPDATE: Please note that two of those commenting in the review sections report allergic reactions following meals at this restaurant in the same week (March 2019). The restaurant was great at communicating with its customers and has a good top-8 labelled menu (as shown in this article).